CollabHub is here to give you a platform for pitching ideas and finding partners to explore them. This has led to strong professional networks and employment. It can also lead to prototyping and the development of projects that you might take on for further development, such as through Honeypot where you will find opportunities investment and further networking. We welcome all students and non students! All communities, mature, independent and small business. All disciplines! Especially engineers, computer programmers, educators, social workers… to see what might be possible through the sharing of your work and practices with other disciplines. Innovation through collaboration! Make a note of the dates for Spring! This is a networking and project development meeting. Come to present an idea, no matter how modest or ambitious. Or to just hear some ideas being pitched to see if something sparks your curiosity. We also like to invite specialists on collaboration, creativity and enterprise to come and share their wisdom. Watch this space for further announcements. We will meet at CoffeeKabin for this event. 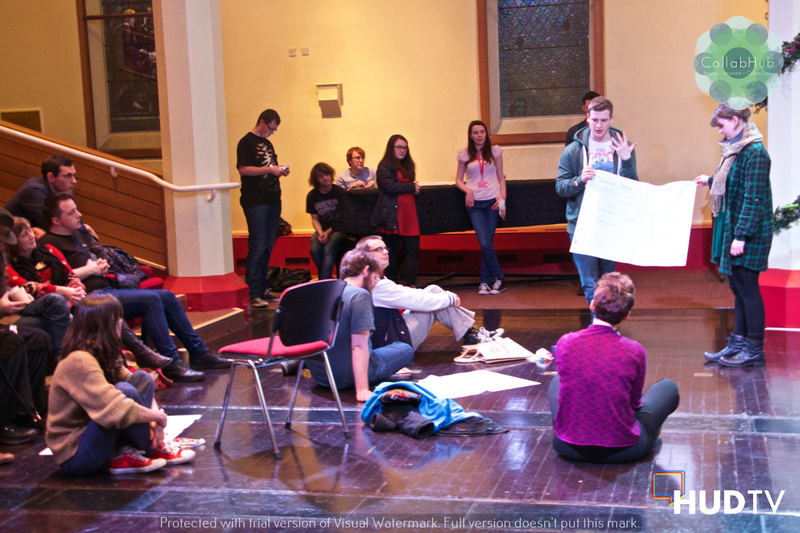 Bring your kit and explore the possibilities of collaborative development. 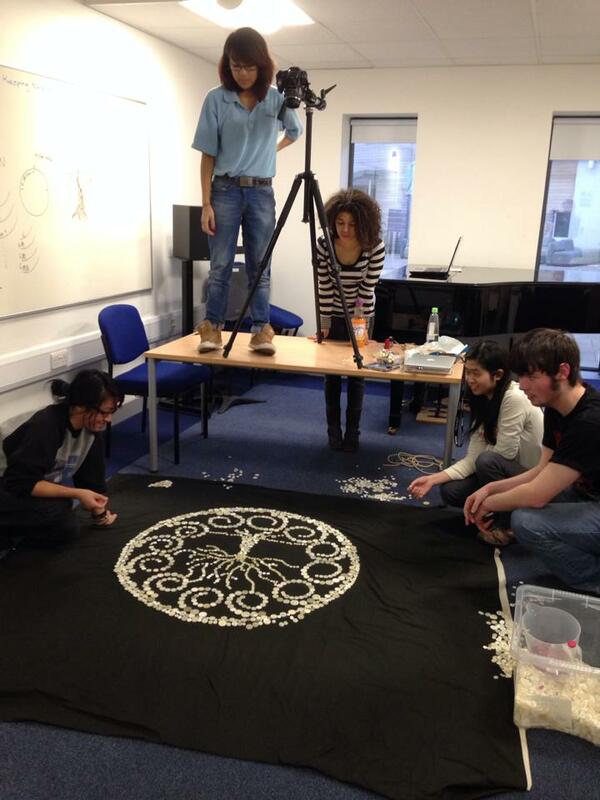 April 18th 10:15 Phipps Hall – Creative Arts Building University of Huddersfield. Collaboration requires you to develop an understand, together, about what it is that you’re doing. This is complex when you work in different subject disciplines, and possibly more challenging when you come from different cultures. But this is probably the most inspiring collaborative opportunity, to build your international networks for future practice and professional work. In this workshop Dr Liz Dobson will offer a short presentation on the challenges of collaborative practice, some models and some of the most contemporary thought on learning and development of the self through collaboration. Internet platform Collaborizm will talk about their platform for international collaboration. Some of our international students will talk about personal intercultural experiences of collaboration and we hope to inspire new connections and new opportunities for you to progress a project based on the idea of working with people from very different backgrounds and cultures to your own. Look out for the Symposium in May! There is a large home schooling community in Huddersfield. So we have decided to invite students to come and skills share/swap with young people in a very special end of year workshop. Participants could be any age, attending with parents to learn what you do – directly from you! This requires careful planning so if you are interested please email us e.d.dobson@hud.ac.uk and we will send out a doodle poll to set this up later in the term. This week we welcomed a wonderful group of makers to our collaborative making meeting. After a brief introduction from Liz Dobson around 15 people introduced themselves, showing examples of their work and explaining the ideas that inspire them. We soon got to free improvised collaborating, noticing how some people work with very different making time frames (from immediate building, to thoughtful development of concepts over weeks, to sound processing that takes 6 weeks). Two projects were prototyped within the evening! One using MakeyMakey to control animation with copper tape and a ‘cello, and the other creating a keyboard music display that shows images depending on which notes you play. Though they are early ideas, there was a lot of discussion about cross-discipline possibilities. Several excellent contacts were made and I’m excited to see what that may lead to. Kevin Threlfall kindly put together this short film – we are delighted! Please click HD for higher quality image. On Tuesday Jan 19th an exceptional group of practitioners are coming together to devise new work through collaborative improvisation. A little like a hack lab but without the necessity to hack code or electronics (though this may happen) and a little like theatre improvisation, in the sense that no one person knows what the output of our improvised collaborative emergent creating will be! Others will be attending and you are welcome to bring your laptop, materials and a mug (with tea bag) to observe or participate. Please e-mail e.d.dobson@hud.ac.uk with two sentences about yourself and your links. We welcome games developers, engineers, scientists, economists… basically anyone. You don’t need to be a creative practitioner to participate but you may have a content and knowledge to inspire an installation, interactive piece, new performance or materials for communicating it more effectively than before. Here is the team so far! I’m fascinated by collaborative emergence and distributed creativity. Background in music and music technology, current ground in building communities for learning through collaboration and for fostering new opportunities for creating work. Hi:) I enjoy various approaches to making art, since handing in my MA in Instrumental Composition at Huddersfield in September, I have performed my first solo show, had a premiere of a cello trio, exhibited sculptural and collaborative sound work at two exhibitions and organised a couple of concerts. The next concert I am organising is in a mirrored room in my studio space in Huddersfield as part of the exhibition ‘And to Dust all Return’, curated by the wonderful women at U N N A W A Y! Exhibition opening this Friday 22nd and concert is 29th- all welcome!! My work is primarily animation and graphics but I dabble in anything creative, I enjoy using textures and creating hand made work. I do a lot of animation at the moment but my real speciality is in traditional drawing, particularly with pen and ink. I love character designing, high detail levels, and robots. Especially robots. I’m a cellist who is beginning to explore electronics through acoustic instruments (I use a bug pickup). My musical genres vary greatly, although my main work is with ‘Stems’, a cinematic art rock group. I am a second year graphics design student at the university of huddersfield and enjoy learning about different things which can be incorporated into my practise. Dex Hannon is one part of the Broken Toy Company. an art collective with a twist. 4 artists. One mind. He is an artist that works across many fields. Photography, digital art, multi media and painting. My interests and strengths are composition, motion graphics, and modern programming practice in C++. Algorithmic composer specializing in generating timbre from algorithms relating to nature. Can work in Max/MSP, but specializes in C++ and other compiled languages. I try and do stuff in the crossover between making in the arts and making new technology. I am an artist often working on the boundary; or perhaps the grey area… between the abstract and the surreal, though recently spending time working on ‘realism’ and how it may help to improve my work in other areas, and in the future. Julian Surma as been attending meetings and the CollabHub symposium throughout his degree. Drawing on the networking and project development possibilities he has developed lasting collaborative relationships with students in other departments as well as with people outside the university. Enthusiastic to get involved and see where things might lead, Julian developed his interest in education through a special CollabHub initiative with business degree students. His team developed new software, drawing on gamification education for music theory learning and he is now well connected within the indie games network and has now secured a professional collaboration with Fireblanket Games. All before completing his degree in Music Technology and Popular Music! Meetings take place throughout the academic year – so keep an eye on the Facebook group for news! 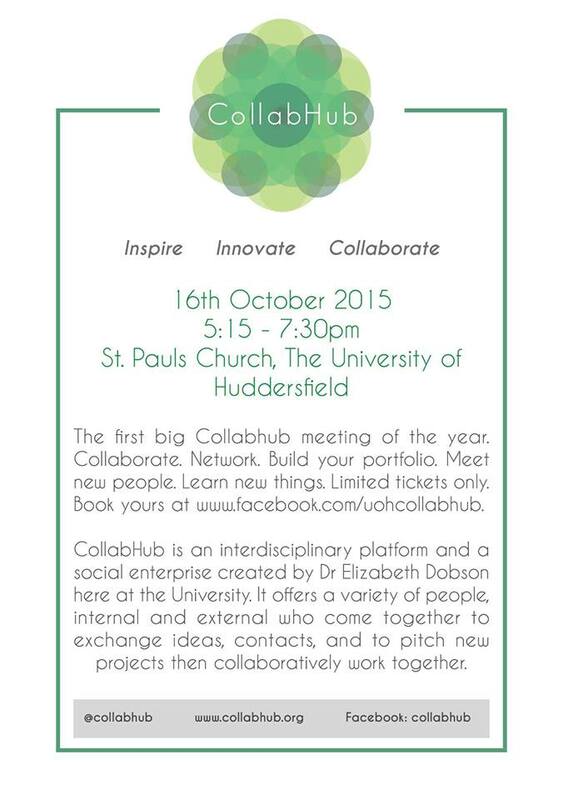 The next CollabHub meeting will be on October 30th at 15:15. It is a fantastic opportunity to meet people from different disciplines, hear ideas for projects and pitch your own. Maybe you are a game developer and you need sound designers, or a composer looking to compose music for film. Or a project manager with interest in working in the arts? All disciplines, students and non-students all welcome. Also here is the Facebook event group. Feel free to join there, to network and to see who else is going. We’re looking forward to seeing you at the first meeting of this academic year. Explore the website to see the kinds of projects people have undertaken in the past. We are really keen to welcome more students from engineering, science, education and human and health sciences too! The power of multidisciplinary collaboration is that it offers potential for true innovation. So if you have an idea, a dream or just a project you’d like to get off the ground. You can come to a meeting, pitch it and see if there are other people interested in bringing complementary skills to the table. CollabHub is the platform for exploring and building your networks too. You could find your future business partner, or build a creative team! Liz Dobson and the CollabHub Team.